Here is some chess news from Zambia: About 140 players, including members of the national chess team are playing in the National Airtel Chess Challenge which began this Saturday at the Olympic Youth Development Centre (OYDC) in Lusaka. 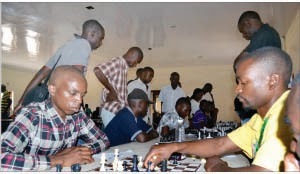 Lusaka Province Chess Association (LPCA) technical director Stanley Ngulube said in Lusaka the two-day tournament has been divided into three categories for all levels of strength from Beginner to Master Level which was the Elite, Open and Children under-15. Ngulube said his association had invited members of the national team to the event to make the Challenge more competitive especially for the beginners. The tournament is free for players under 18 years old and female players to help promote chess. “This event has attracted 140 participants from across the country and among them are 20 elite players,” he said.